Landbridge Group Vice President, Mike Hughes, will share an overview of Landbridge’s strategy for Northern Australia covering the significant development of the Darwin Port. In 2016 Landbridge were successful in taking on a 99 year lease with a commitment of a multi million dollar expansion to expand capacity. Mike will also be giving an overview of WestSide, an oil and gas business based in Brisbane. WestSide is a small onshore explorer and producer currently selling gas in Queensland into the LNG facilities in Gladstone. ASCO commenced a 20-year contract in 2014 to operate a new dedicated oil and gas support facility located in the expanding Port of Darwin in Northern Territory. The Darwin Marine Supply Base has been designed and built by ASCO to exceptional standards, capable of servicing the current and future demands of the Australasian offshore oil and gas industry. James Stuart, Operations Director from ASCO will the vision for cementing Darwin’s position as a major oil and gas hub, how the Marine Supply Base is supporting offshore oil and gas developments in northern Australia, attracting new investment and business opportunities to provide support services, and creating significant new employment opportunities. 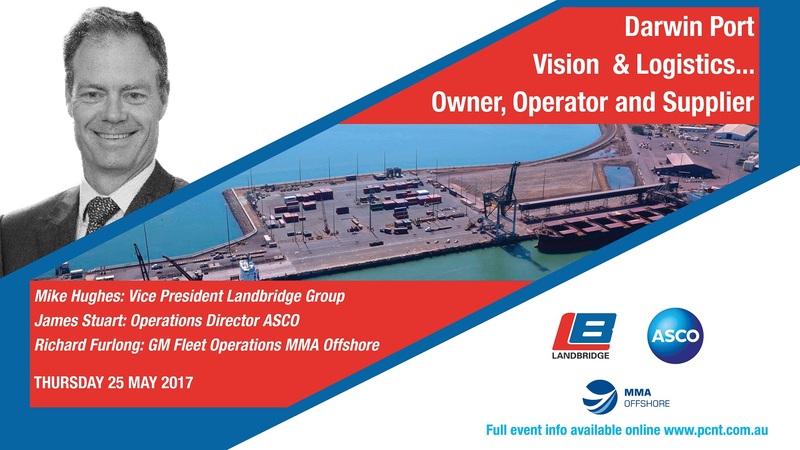 Richard Furlong, Fleet Operations General Manager Australasia will be joining us on behalf of MMA Offshore. MMA Offshore is one of the largest marine service providers in the Asia Pacific region. The company owns and operates a fleet of over 40 modern offshore vessels, including recently named MMA Brewster. The custom-built platform supply vessel constructed by MMA Offshore will be a regular visitor to Darwin Port over the next 10 years, as one of the primary vessels providing drilling, commissioning and operational support to INPEX’s offshore facilities in the Ichthys Field. MMA provides marine logistics services to clients throughout all phases of the offshore oil and gas development cycle.